Woodrow High House (formerly Woodside House), near Amersham in Buckinghamshire, was built in the 17th century. During the English Civil War (1642–1651) Oliver Cromwell, regicide and Lord Protector, housed his wife, Elizabeth and their daughters, Elizabeth, Mary, Frances and Bridget at the house. A Captain James Thomson is recorded as living there after the Cromwells and in 1672 the Presbyterian minister, George Swinho, bought the house in order that his congregation could meet. Woodrow High House originally belonged to the Tyrwhitt Drake family of nearby Shardeloes and William Drake, the Member of Parliament for Amersham, is known to have lived at the house between 1758 and 1766 while Shardeloes was being built. At present it is not known who was responsible for the major building works of the early 19th century. However at some stage between his marriage in 1886 and his death there in 1911 the grandson of the Duke of Newcastle, Charles Stapleton Pelham-Clinton is known to have lived at Woodrow. Although his wife, Elizabeth, died in 1946, a surviving letter from the Shardeloes Estate Office suggests that the house was let in 1923. Sir Nigel Leslie Campbell (High Sheriff of Buckinghamshire in 1937) bought the house in 1909. Curiously he was a nephew of Charles Stapleton Pelham-Clinton. During World War II it is believed that he and his wife occupied the attic floor when a school evacuated from Portsmouth was housed at Woodrow High House. 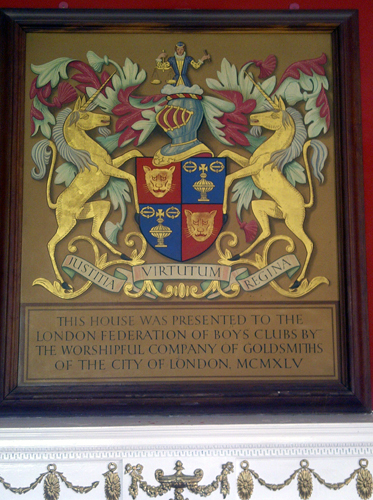 Sir Nigel sold the house to the Worshipful Company of Goldsmiths in 1945 and they donated it to the London Federation of Boy’s Clubs. 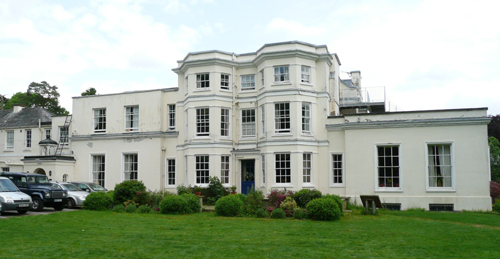 The house is now a residential training centre run by London Youth (Federation of London Youth Clubs). The centre creates a wonderful range of new opportunities for more than 7,400 young people every year. The building has been rendered with a cementitious stucco and painted. It has a slate roof behind parapets. The central block is of three storeys with late 18th century single-storey wings. The left-hand one was raised and extended in the early 19th century. The central block has full height canted bays either side of the centre which has a half glazed door with gothic glazing bars under a dentil cornice. It also has first and second floor bands and a dentil cornice. The windows are double hung sashes. There is a moulded string at head level. 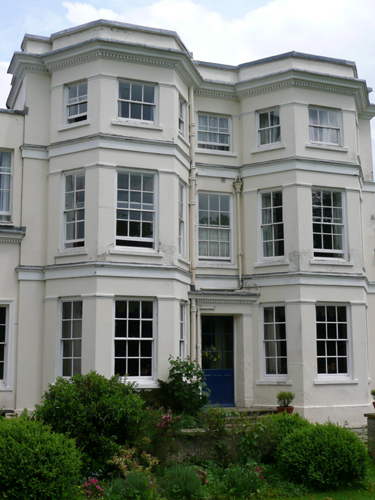 The right-hand wing has a dentil cornice and two sash windows with architraves. It also has a canted bay window to the right-hand return elevation. The two storey rear wing is of similar design. The left-hand wing originally matched that on right but now has a later upper storey. There is a projecting porch on the left with a round arched entrance, cornice and wooden bell cupola with ogee lead cap and a bell that is dated 1830. There is a later two storey wing on the left. The house has been extensively remodelled on several occasions, most recently in order to accommodate the youth training programmes being run there. In spite of this a number of fine period rooms survive and it was in connection with their treatment that I was asked for advice. The house is perhaps best known for being haunted by The Green Lady of Woodrow. Different versions of the tale exist, but it seems that in 1685, following the rebel Duke of Monmouth’s defeat at the Battle of Sedgemoor, Sir Peter Bostock escaped to the house which was lived in by his fiancée, Lady Helena Stanhope. She apparently hid Bostock in a grotto in the grounds. 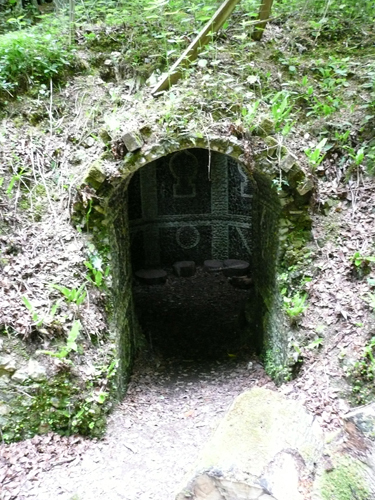 (It is unlikely to be the existing grotto, which dates from the 18th century.) His location was discovered, possibly when she was seen carrying food to him. He was killed by the authorities for his part in the Monmouth Rebellion and Lady Helena Stanhope committed suicide, possibly by taking poison. As Lady Alice Lisle, of Moyles Court in Hampshire, was executed for hiding fugitives from the Battle of Sedgemoor, suicide may have been the best option for Lady Helena. A ghost of a woman dressed in green is said to haunt Woodrow High House. It has been seen several times, one well documented sighting dates to January 1946 soon after the house was taken over by the London Federation of Boys Clubs. Terry Lawson, the federation’s secretary, was staying overnight and woken by the sounds of footsteps in the passage outside his room and a swishing sound as if from some material. He lit a candle and went to investigate but there was nothing there. He went back to bed and as he was falling asleep he heard the same footsteps and the sound of something being dragged along the floor, like a long dress. The sounds came up the stairs then right up to his door where they paused and then they moved on to a room now called the Cromwell Room. During the following day a search was made of the house but nothing was found. That night a boy, hoping to catch sight of what had made the noise, crept quietly down the corridor and had just reached the top of the stairs when he heard footsteps coming from behind him. Turning round he saw a ghostly figure dressed in green gliding towards him. He followed her down the stairs and into the dining room just in time to see her pass through the centre window which is where the front door of the house used to be. The story goes that he followed her across the lawn and over a field until she disappeared in the spinney where the grotto is situated. 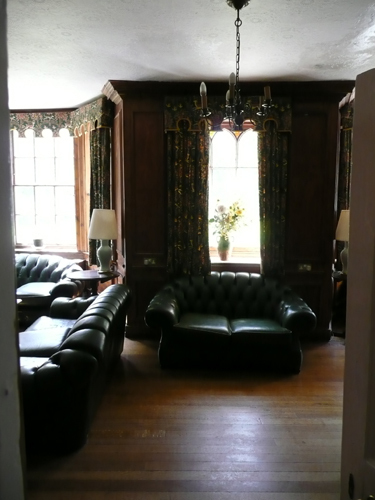 I have also worked on another house that was haunted – Raynham Hall, in Norfolk. My father was the poster boy for the federation of boys clubs. His name was Frederick Webb. He has recently passed away. I would love to know how he came to Woodrow High House when he was a boy. Also, if at all possible, information on how I could obtain a photo of the poster Dad was in. I sincerely hope you can throw some light on this part of my fathers life and await in anticipation any information you can let me have. I was there this week on a school trip and i saw the green lady at the end of the stairs as she walked past me i jumped out of my skin – nobody believed me . but on the last day we had a campfire tales and they told us all about the ghost and the grotto, now my friends believe me. Amazing! Thank you very much for confirming the story. I was there on school trips back in the 70s and fellow students reckon they saw the green Lady. I never quite disbelieved them! Good to know that woodrow is still there and young people are still enjoying its charms. It’s a great place doing wonderful things. I’m sure you must get inundated with comments such as this so I’m very sorry! I’m trying to find out what happened to my great Aunt Kate (Wingrove) who worked at Woodrow High House in the mid 1900′s… if anyone there or reading this is able to share anything it would be greatly appreciated. Wingrove is her married name (husband Albert, children Ron, Frank, and Elsie). Thanks for that. Have you tried contacting Woodrow High House (Google)? Failing that, let’s see if anyone responds. Good luck. I got told about the green lady but none of my friends believed it and neither did I. But Saturday night my friend heard the door at the end of the hall slam and me and my friend went to go and see what it was anyway we saw like a hand on the door handle on the way back. We felt we were being followed for the rest of the trip ???? I stayed here for a week on a school residential trip in either 1989/90. We were told about the green lady on the last day (although previous year groups told us all about the building being haunted beforehand). We were told if the grandfather clock in the hallway chimed an incorrect number of times, that meant she was in the house, although nobody on our trip saw her that I’m aware of. Me and my friend Sarah were asked to exchange rooms after the first night with four boys who had been found crying and scared to death, as they had apparently been lying in bed, when a huge green blur flew over the top of them and was looking at them in ‘an angry way!’ and she made the room shake. I will never forget the excitement the next morning, as these were the popular boys, the tough nuts, and they were reduced to gibbering wrecks! We were told (cannot remember who by!) that if the clock chimed that meant the Green lady was in the house..but w.e never heard it. Sadly the only exciting thing that happened to me and Sarah and the two other girls that then stayed in there was that Mary-Anne lost her cuddly E.T. toy that she adored! I had the absolute best time on that trip. The breakfasts were lovely, we even had a talk on snakes at one point in a room where there was a painting where the eyes would follow you about! We did the assault course, tree rubbing, ping-pong, football, it was a lovely trip, and I remember so much of it despite it being about 30 years ago! We went there as a residential couple of days with my youth group in 2015. Heard the story about the green lady. One the day we left we were told that the green lady was in our support workers room a day before we went.